As the title suggests spring across western Europe was very late this year, almost a month be hide normal, which meant we had cold dry days in Valsesia for May. The snow only finally started to melt late in the month. The runoff was a strange pattern of occasional rain storms bringing higher water for a day or so, and then levels dropping off with every cold night with clear skies. This cycle pretty much went on and on all month. This meant that although flows were Ok to good, there was always a sense that we were waiting, and waiting. Thankfully in the late week or so, then into June, the warm weather finally brought the goods and for those heading out to the Alps in June were surely very surprised with fine Piemonte and Ticino conditions. The steep creeking weeks in Piemonte are getting incredibly popular, Gene17 now runs 3 weeks of trips, plus the Valsesia River Festival. Valsesia is an iconic destination, and we all love working there for the quality of paddling and fine food and local culture. The work focuses heavily on the technical aspects of paddling on drops and slides. This can mean actually getting right to the drop, and helping with the tactics, to ensure the paddlers are in the right place to apply the technique. We use a lot multi shot stills images for feedback, as it’s possible to zoom into the specific areas for detailed observations. 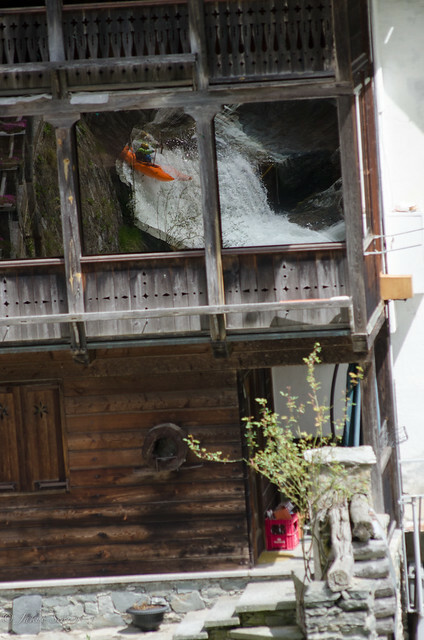 Jakub got a great shot however of myself running the last drop of Gronda being reflected in a window of a traditional river side house in Rassa, Valsesia, nice! A short intermission, was a weekend in the UK for a wedding party with the family. We headed to Topsham near Exeter, for a blustery affair. The short boat crossing to Double Locks had the ladies in their finery shivering in the stiff breeze. Still once in the amazingly decked out party tent, with its open fire, a great time was had. Old friends from a far mixed in with the Devonshire locals, an excellent wedding occasion at a shunning location on the Exe estuary. The weekend was all too short, as I needed to get back to work in Italy, and an early morning train stole me away. 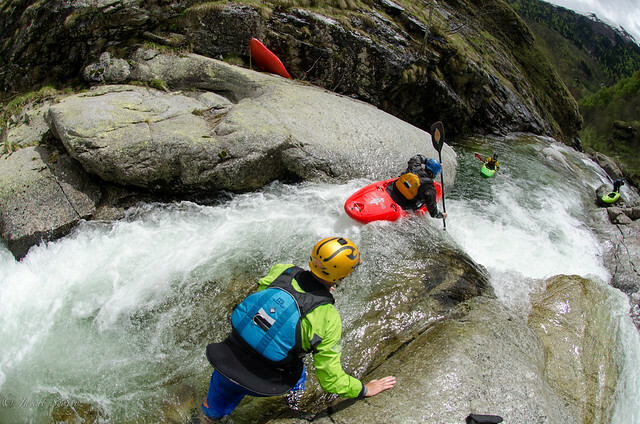 More kayak coaching work and then the Valsesia River Festival, now in its third year, with momentum now gathering to create a well established event in Italy. Dealing with local politicians is every bit like you’d probably think it would be like, in Italy, boringly problematic, especially compared to my Sjoa in Norway experiences. Still with a great partner in the event in the form of il Gatto e la Volpe Camping, I do not really need to concern myself with the frustrations of the local mayor. Over 100 paddlers took part in our race programme, with the team race being the most popular. Teams of 3 charge the Sesia Alpin Sprint, a classic Class III/IV boulder garden section, fun lines and lots of moves to enjoy. Gene17kayaking runs clinics during the week, which are popular and provide a great taster of what we do. After the chaos that is the Valsesia pack down, Soča turn around and then the long road north to Norway, all in a week, I was happy to be at home for a few weeks before the summer starts in Sjoa. These days I spent a lot of time with the little lady, and we managed a sea kayak outing with friends on the lake at Lillehammer. My daughter would help with the paddle strokes, we stopped for a classic summer grill en route and afterwards she was very happy to get back in the boat again, to my relief. This entry was posted in Blog and tagged bella italia valsesia creeking, Valsesia piemonte steep creekin', valsesia river festival. Bookmark the permalink.